Golden Nugget is a prolific, long-keeping variety of pumpkin with small, orange, flattened, spherical fruits. The light orange flesh inside is sweet and finely textured. Harvest in 75 to 95 days from planting. Each packet contains 12 seeds. The species Cucurbita maxima is of South American origin. This particular cultivar was developed in 1966 at North Dakota State University, an institution that has been heavily involved in pumpkin breeding programs over the years. Golden Nugget is a long storing variety with a hard, ridged skin. The fruit are shaped like a flattened sphere about 10-15cm in diameter. 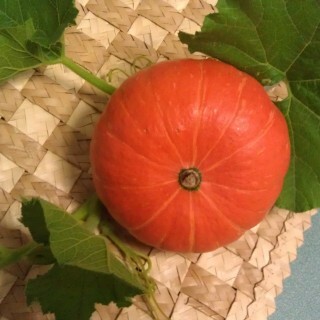 The rind of this variety becomes a darker orange as the pumpkin ripens. The lighter orange flesh inside is finely-textured and sweet, although it does contain quite a large seed cavity. In a cool dry place this variety will keep for a couple of months, storage will also improve its flavour. Because they're small, Golden Nugget pumpkins can be roasted whole or halved. This variety is good pureed for soups, or diced, cooked and added to risottos or salads. Seeds of this variety can be collected during preparation and roasted in the oven, they have a delicious nutty flavor when just eaten plain or with a little salt. An old fashioned treatment for tapeworms involved fasting for a couple of day then eating a meal solely of pumpkin seeds, the roughage of which cleared the tapeworm out of the hosts system. The young shoots of the pumpkin vine itself can also be cooked and eaten. Plant the seeds 3cm deep and about 1m apart. Does best when sown directly into hills of built-up garden compost, plant a couple of seeds into each hill and thin out to the healthiest seedling a few weeks after germination. If you want a denser patch a couple of seedling can be left to grow per hill. The seeds will also readily sprout in compost bins and can be successfully transplanted into the garden if they are removed before the seedling becomes too leggy. Pumpkin seed need a soil temperature of about 20 degrees Celsius to germinate. Sow all year round in tropical and sub-tropical areas or after the last frost in temperate areas. Pumpkin vines have shallow roots systems and large leaves and because of this can be prone to drying out, so keep well watered. Pumpkin vines spread rapidly, can climb and can take over less vigorous plants so plant them well also from any neighboring plants. If you see any black and yellow zig-zag striped ladybirds on your pumpkin leaves let them be as these will be feeding on powdery mildew fungus which pumpkins can be susceptible to. Hand pollinated can improve fruit set especially when the weather is warm; find a male flower, remove the petals and dab the pollen onto the stigma of the female flowers. Likes rich, well-drained soil in full sun for best fruit formation. This variety takes between 75 and 95 days from planting to harvest.